Though Ojibway Obediah Johnny Yesno had a name his peers made fun of in high school, his self-confidence remained intact, and, along with his natural good looks, served him well in a career that played out in the public eye. Others might more easily identify him as the smooth-voiced host of his own Native Affairs program on CBC Radio, entitled “Our Native Land”. He shared celebrity status on CBC with the likes of Peter Gzowski and Bruno Gerussi. The isolated Ojibway-Cree community of Fort Hope on the Albany River in Ontario that Johnny grew up in was like many back in the 1930s, without a school and populated with individuals who hunted, fished and trapped for a living. In stepped the government to civilize the savages, and off went Johnny to the Pelican residential school just outside of Sioux Lookout. He was only five and he was terrified. Packed with other children into a noisy train, Johnny had an identification tag hung around his neck, and, as he was often heard to say, had no idea how he survived those awful years. His school memories are hazy, but the sharp edges emerging from that merciful cloud revealed images of physical and sexual abuse. “Some supervisors just liked to beat up kids,” he said. Things were bad enough for Johnny and a friend to decide to run away in the cold of winter when they were nine years old. The pair got lost and found themselves in Kenora, where they were rounded up by police and handcuffed. As soon as they were returned to the school, the headmaster informed them they would have to have their heads shaved. But in a rare show of Indian against authority, Johnny’s father, John Cooper Yesno, stepped in to put a stop to the punishment. Instead, in a stroke of good luck, Johnny was banished from the school and sent to Shingwauk in Sault Ste. Marie. The transfer was good for the young boy because institution staff treated students better than those at the Pelican residential school. At Shingwauk, individuals tried to help and support the students make their transition into the fast changing white world. Johnny outdid himself in his new placement and proved to doubters that he could be academically successful. He carried on with his studies at the University of Waterloo, electing to enter the engineering faculty. It was the 1960s, a time of open expression, and Johnny soon found himself with a wife and a son on the way. He found work with an engineering firm in Toronto, and found a creative outlet for himself with a dance group that performed at a city tourist spot. It was just a spare-time gig, but it gave Johnny his big break. A CBC producer saw the young man’s star-power on-stage and offered him a screen test for a part in a drama he was going to shoot. 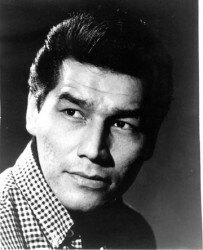 Johnny won the role and portrayed Joe Smith, an angry Aboriginal man who commits suicide in a Toronto jail cell. The scene was from the popular Wojeck series and it won Johnny an acting award. Later, he would win several more mainstream acting awards in both Canada and the United States. Bitten by the acting bug, Johnny gave his notice at the engineering firm and was soon studying acting at Toronto Workshop Productions under George Luscombe. The next years of his life were filled with stage and film productions and the radio work for which he became so well known. In the prime of the Indian movement in the early 1970s, Johnny interviewed the prime minister, Indian Affairs ministers, and celebrities throughout North America. At the peak of his career Johnny succumbed to the malaise attributed to many a successful artist. He admitted he “drank and partied way too much” with his “actor friends” and lost his edge. Too many missed appointments and absences from film sets took their toll and the acting jobs dried up. Eventually, Johnny returned to northern Ontario and worked as a civil servant until his retirement. He lived with his companion Rosemary King, whom he met on a blind date, for many years and the two loved to travel Ontario, often returning to her home community of Wikwemikong to visit. Johnny loved nothing more than to sit around a campfire and tell stories of his acting career. Always humble, Johnny commented “it was nice” to receive the Order of Canada in 1976 from Governor General Jules Léger. He also returned numerous times to Fort Hope to promote education and encourage students there to go to school. Johnny took his last breath on March 20, 2010 at the age of 71.